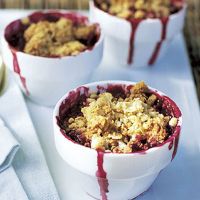 Soft fruits make lovely crumbles, their juices bubbling up through the sugary topping. Make them in individual dishes and serve with scoops of vanilla ice cream. Preheat the oven to 200°C, gas mark 6. Lightly grease the sides of 4 x 225ml ovenproof ramekins or teacups (don't use your finest china cups) and place on a baking sheet. In a bowl, mix all the berries together with 50g of the sugar and divide between the dishes, pressing them down gently. Put the flour in a bowl and add the butter, cut into pieces. Rub in with your fingertips until the mixture just starts to bind together. Stir in the remaining sugar and the oats to make a coarse crumble. Scatter the mixture over the fruits, piling it up in the centre as it will sink after baking. Sprinkle with a little extra sugar. Bake for about 30 minutes until the crumble is golden and the fruits have started to bubble up. If you don't have any individual ovenproof dishes, make the crumble in a 900ml shallow ovenproof dish and allow an extra 5 minutes' cooking time.